What a year it has been for the Melbourne Storm. They’ve just won their fifth premiership in their short 20-year history, to go along with the outstanding, record breaking season that was 2017, ultimately setting the benchmark for the bright future of the Storm. The Player of the Year Awards night was fit for a celebration, of not only the individuals, but the club as a whole and the success on and off the field in 2017. The club has had one of the most outstanding seasons ever recorded in the National Rugby League, with many individual accolades capping off a near perfect season. There were a record number of players selected in the Australian Kangaroos side, a Dally M winner in Cameron Smith as well as the all-times games record in the NRL, a Clive Churchill medal for Billy Slater, most tries in the competition for Josh Addo-Carr and Suliasi Vunivalu (23), most lines breaks for Josh Addo-Carr (26), second most points for Cameron Smith (192), 23 wins and 4 losses, most points scored and least points conceded as a team and most tries and most tackles of any team in 2017. The numbers don’t lie; it’s been a big year. From this disappointment, the club posed a question at the start of 2017. From that question, a steely resolve was built. 2017 would become a year of hunger and redemption. The club had a point to prove to not only themselves, but the whole of the NRL world. Everyone, from the Board to the playing group, responded emphatically to the challenge of 2017, eager to go one step further. ‘They were committed and ready to emerge as a fresh-faced club, with strong morals,’ stated Chairman Bart Campbell. Just a few days after the Grand Final win, Campbell and the club revisited a question that was raised constantly throughout the Storm’s surge. These ‘greater heights’ included the rise of young guns Josh Addo-Carr, Curtis Scott (Rookie of the Year) and Brodie Croft (Cooper Cronk Feeder Player of the Year), who emerged as not only leaders, but also vital to the team’s success. There was mention of Kenny Bromwich, Dale Finucane and Felise Kaufusi, who were explosive and headed on an upward trajectory, using this season as the springboard for what’s to come. This attitude was a key factor to Billy Slater playing on in 2018, highlighting the commitment the club has made to supporting its players while striving for ultimate glory. Winger Josh Addo-Carr said that Slater, who officially announced on stage that he will be playing on in 2018, was ‘good to have around’. “I’m pretty stoked to have him around. He’s so good for our team,’ Addo-Carr said excitingly. Discussions then turned to the ‘irreplaceable’ Cooper Cronk, who will be departing from the Storm as a Premiership hero. 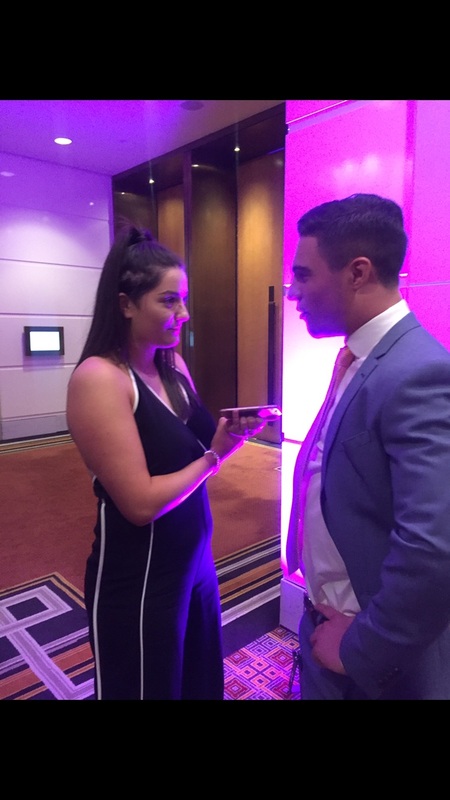 Brodie Croft who took home the Cooper Cronk Feeder Player of the Year title, described Cronk as a ‘major inspiration’ to the up-and-coming talent. Cooper Cronk fittingly summed up the true meaning of the ‘Purple Pride’ to close out the eventful night. And that’s the benchmark that this legend has set for the future of the Melbourne Storm. The Player of the Year Awards was an opportunity to reflect on the triumph of 2017. The tireless efforts and the willingness to work hard by the players, coaches, staff, board, and members helped deliver the ultimate in 2017. This is a new benchmark for the Storm and for the NRL.